This one above has served us well and is super simple to duplicate. We just painted clothespins (Chase's were orange and Beckham's were yellow), wrote responsibilities on each pin, designated a "to do" and a "done" side of a thin board, found a place to hang it, then as they complete their jobs, they get to move the clothespin to the "done" side. Everyone gets a kick out of Beckham's responsibility of "finding poop". Thinking of things a 2 and 3 year old can help with was challenging, but he was really good at spotting dog piles in the yard, so he helped me locate the landmines! I decided to change things up slightly this year. 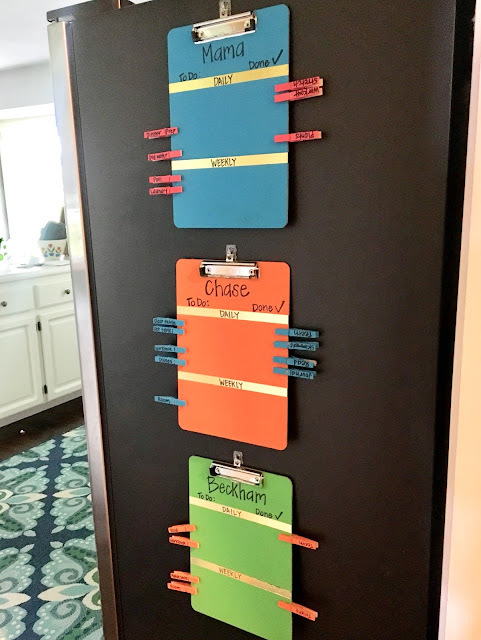 After seeing how Carrie from Making Lemonade did her chore charts, I liked how she used the same clothespin method, but she dedicated a separate clipboard for each child and she divided chores between daily and weekly responsibilities. 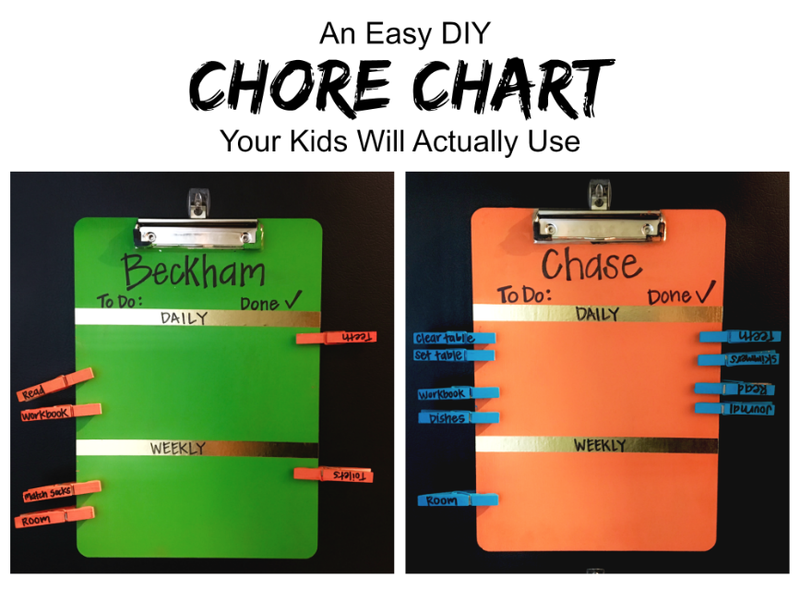 With our old chart, I will say that sometimes it was confusing, especially for the younger kids, to see some of the weekly chore pins on the "to do" side and understand that was ok because it only needed to be completed once or twice a week. 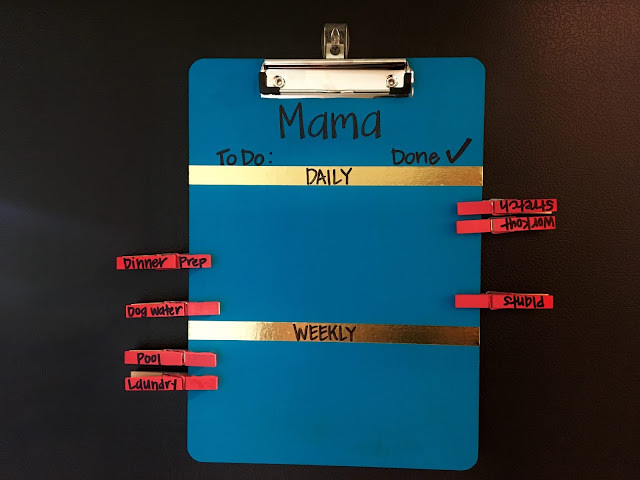 Having a dedicated daily and weekly section helps them see that they need to get ALL of the daily jobs completed each day, but the weekly ones have a little more time flexibility. 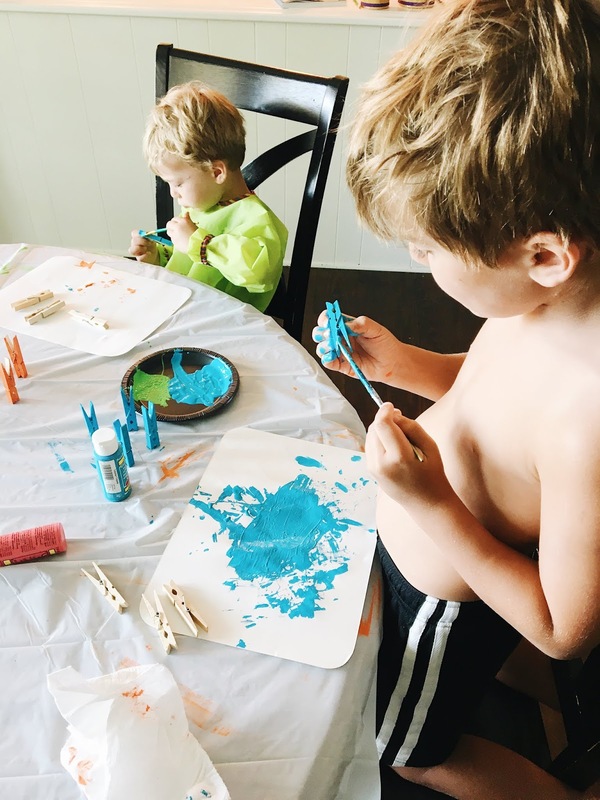 The boys enjoyed painting their clipboards and clothespins! We have adjusted the responsibilities throughout the years and once they seem to be doing something as second nature, I take that pin away and sometimes replace it with something else. For example, I used to have a clothespin for taking their dirty dishes to the sink....but they are both really good about that now, so I didn't feel the need to continue to have it on their chart this summer. But, for some reason brushing their teeth is often forgotten (without several reminders), and therefore it's still on the list! I even decided to do a chart for myself for a couple of reasons. First of all, as we all know, I have waaaaaaaayyyy more responsibilities than what I listed. But, I wanted to show the boys that I accomplish things throughout the day also. If they are wanting me to play with them, but I need to prep for dinner first, it's easier for me to say, "Mama is doing her chores so she can mark all of her clothespins complete". For some reason this resonates with them better than me just saying I am busy cleaning the kitchen or chopping veggies. Another reason I made a chart for myself is that it's been a great reminder for things I may otherwise forget! Like watering the plants. I forget that. A lot. And my poor plants usually don't make it past July. So, I am hoping with this to help remind me, I can keep them alive a little longer! I also included working out because it's good motivation for me! And who can't use a little extra motivation? I just used Command hooks to hang them on the side of the refrigerator. At the end of each night, I move the clothespins back to the "to do" side and give the boys a sticker on a separate chart. If their sticker chart is full at the end of the week, we can go do something fun from our summer bucket list! Honestly, those rewards are things we would probably do anyway, but it doesn't hurt a darn thing if they think they earned it (wink wink). Now it's your turn! 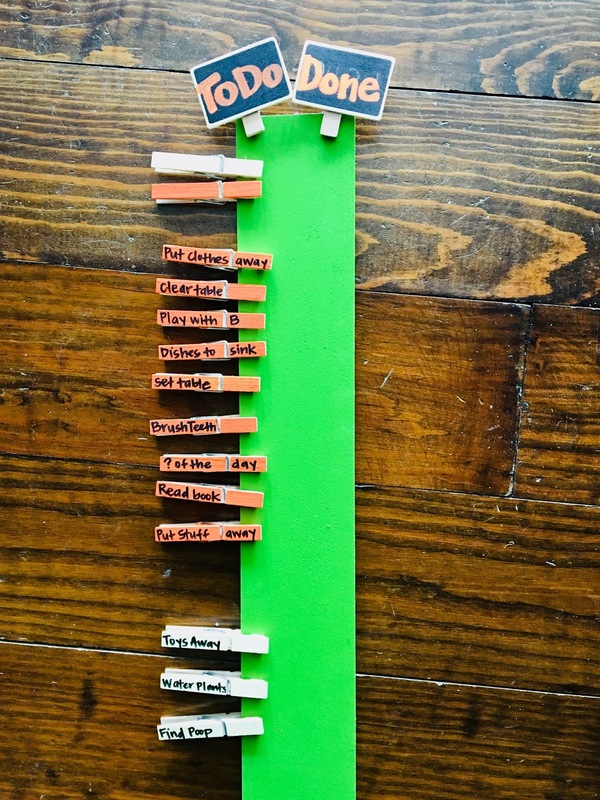 What kind of tracking system do you use to motivate your kids to help out around the house? All of this stuff should be available at Hobby Lobby, but I am linking similar options here! ***Some of the links in this post may be affiliate links, which means I make a small commission. Thank you for supporting my blog!